On the eve of “Swachhata Hi Seva” campaign started from 15th September’ 2018, a mass social service was conducted by the Kra Daadi District Administration on 29th September’ 2018 at Govt. Residential School, Dogio Langpo in Sangram village under Palin Circle. All Administrative Officers and HoDs of all the line departments led by DC S. Miji took active part in the social service by clearing the approach road to school and cleaning the school’s campus. Interacting with the school children and villagers on “Swachhata Hi Seva” awareness, DC S. Miji said cleanliness is for clean environment and healthy life, it shouldn’t be limited only during the Govt. launched campaign period but inculcate cleanliness habit for regular routine. 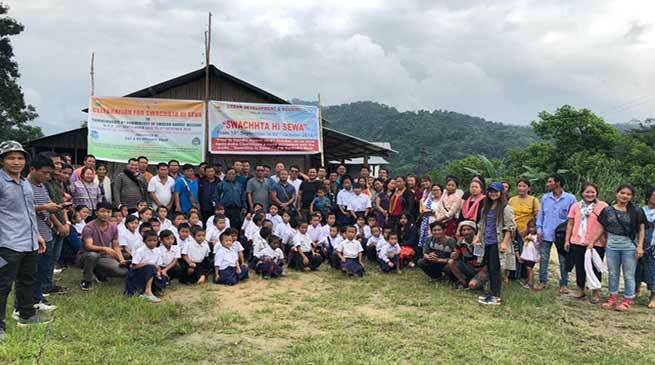 DMO Dr.Higio Tama, EE PHED Er.Likha Teki and DD (UD) Er.Patey Punung spoke in details on importance of cleanliness for healthy life for the awareness of the school children and villagers.